Nancy Boren grew up in a home surrounded by paintings and drawings, welcome in the studio of her father Cowboy Artist of America member James Boren; she decided early on she also wanted a life in the arts. 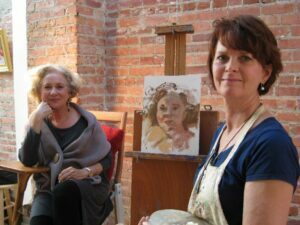 She received a Bachelor of Fine Arts from Abilene Christian University and cites the influence of notable traditional painters such as Sargent, Sorolla and Fechin. She has exhibited at the National Cowgirl Museum and Hall of Fame, the Gilcrease Museum, and the Catharine Lorillard Wolfe Show at the National Arts Club, NY. Her paintings were used in the feature film 9 Months and the ABC TV showThe Benefactor. She was one of five finalists in the state of Texas for the design of the Texas Quarter in 2004.